This is a great dish to serve if friends are gathering for dinner. Spanish Rioja goes particularly well in over and alongside the lamb. 1. Preheat the oven to 200°C, gas mark 6. 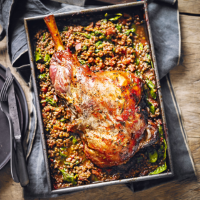 Place the lamb, fat-side down, into a large, deep roasting tin. Pour over the chopped tomatoes, add the onion, garlic, lamb stock, wine, brown sugar and rosemary, then season. 2. Cover with foil and bake in the oven for 1 hour. Remove from the oven and carefully turn the lamb over. Add the lentils and stir to cover them in liquid. Replace the foil and return to the oven for another 40 minutes or until the lentils are tender. 3. Remove the foil. Roast for a further 10-15 minutes or until the lamb browns and the skin starts to crisp up. 4. Lift the meat onto a board or plate. Leave to rest for at least 10 minutes before carving. Meanwhile, remove the rosemary stalks from the lentils. Stir in the spinach, in batches if necessary, until it wilts. Season and add any resting juices. Serve with the lamb, and purple-sprouting broccoli with chilli and lemon, if you wish. This recipe was first published in Thu Oct 13 10:30:00 BST 2016.